Purchase a permit allowing recreational fishing at the Warren, Bundaleer and Beetaloo Reservoirs. Permits are required for all persons over the age of 16 entering the reservoir reserves. Children under the age of 16 must be accompanied by a permit-carrying adult guardian. Purchase your Reservoir Fishing Permit below. Once payment is complete your permit will be instantly emailed to you so you can start fishing! Annual permits ($33) and 3 day permits ($10) are available. 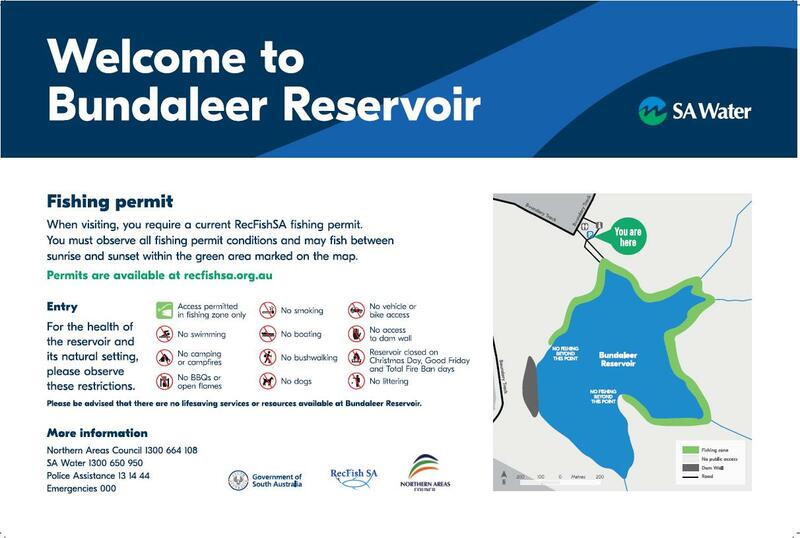 A RecFish SA Reservoir Fishing permit allows access to Warren Reservoir near Williamstown, Bundaleer Reservoir near Spalding, and Beetaloo Reservoir near Laura. It is a condition that all persons over the age of 16 entering the reservoir reserves must have a valid RecFish SA Reservoir Fishing permit. Children under 16 must be accompanied by a permit holder. Note: A single permit entitles the permit holder to fish in Warren, Bundaleer and Beetaloo reservoirs. It is not necessary to purchase a separate permit for each reservoir. Read the full permit conditions (PDF). For more information, view the brochures for Bundaleer, Warren and Beetaloo Reservoirs.